Construction is one of the most dangerous industries to be employed and one of the most dangerous construction tasks is working in an elevated area. Falls from an elevated position are historically the leading cause of death for construction employees. According to the Bureau of Labor Statistics, over 1/3 of construction fatalities are caused by a fall. Over 2 million construction workers (about 65% of all construction workers) perform at least some their tasks while standing on scaffolding. When scaffolding isn’t properly and securely assembled or if there is failure to follow the required safety standards, accidents are likely to occur. Worker falls from an elevated area are not the only injuries that can be caused by scaffolding or ladders. Workers can also be injured by materials such as tools falling from the elevated area or the scaffolding or ladder itself falling on an employee. Even though hardhats are required on most constructions sites, they may not provide the adequate level of protection needed when a heavy construction tool falls from a high area. That amount of force and impact can lead to serious trauma to the head and even death. Scaffolding can be separated into 2 groups. The 1st is supported scaffolds, which are one or more platforms supported underneath by poles, legs, frames, etc... The 2nd type is suspended scaffolds, which are one or more platforms suspended by overhead support. Other types of equipment, such as scissor lifts and aerial lifts, are often considered a type of scaffold. There are countless reasons that an injury can occur while working on or around a ladder or scaffolding. Over 70% of workers who are injured in scaffold accidents are from one of 3 reasons. The support gives way, falling after slipping or tripping, or being struck by a falling object from the scaffolding. These are the most common causes of those reasons. Even in perfect working conditions where every construction rule and regulation is followed and every safety precaution is taken the risks associated with working on and around scaffolding and ladders can never be fully alleviated. Workers will inevitably suffer injuries working in these dangerous fields. What Should You do if You Were Injured in a Scaffolding or Ladder Accident? Falls from a scaffold or ladder can cause serious injuries that can be very costly and leave you out of work for a long time. Being out of work leads to loss of wages and with rising medical costs and other financial hardships you need someone on your side to fight the insurance companies. 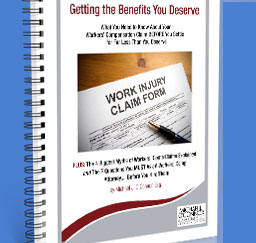 If you have been injured in a scaffolding or ladder accident at work, you should contact the workers’ compensation attorneys at Michael J. O’Conner and Associates. Our experienced workers’ compensation attorneys can help you find out what your rights are and what you can do after a work injury to get your life back on track. Our attorneys will fight to get you the compensation you deserve.